BRYAN, Tx. (August 4, 2018)- In the last away game of the regular season, the Acadiana Cane Cutters split the series 4-3 against the Brazos Valley Bombers. 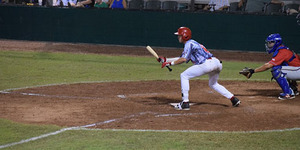 The Cutters got on the board in the third inning after Ragin’ Cajun Alex Hannie (ULL) was hit by a pitch to reach base. Mason Corbett (Texas A&M) then hit a double off the first pitch, moving Hannie to third and bringing Rhett McCall (Lamar University) up to the plate. McCall delivered a sacrifice to bring in Hannie for his first run of the night. Third baseman Chandler Morris (Texas A&M) doubled to start off the fourth inning. Cole Taylor (Texas A&M) followed with a two-run homer to score his Aggie teammate to tie the game. The Cutters took the lead in the seventh when McCall hit an RBI single to once again score Hannie. Brice Armistead (Blinn College) got the win, pitching two scoreless innings in relief and delivering two strikeouts. Kyle Bayles (Mississippi State) got the save with four strikeouts. The Cutters will be back at Fabacher Field again tomorrow (8/5) against the Texas Marshals. It will be Strikeout Cancer Night! The Cane Cutters will be wearing custom jerseys with the names of people who are battling or have battled cancer on them! Gates open at 6 PM and first pitch is at 7 PM for all home games. To get weekly updates on the team and other fun theme nights coming up, please visit our website and subscribe to our newsletter.